Furlong Green, Lightmoor, Telford, Shropshire. SOLD BY NICK TART - WITH 4 BEDROOMS: A modern semi detached family home with garage and driveway. Hallway, Cloakroom/WC, Living Room, Kitchen/Diner, 4 Bedrooms, Family Bathroom/WC, Garage, Driveway, Enclosed Rear Garden, EPC Rating: C.
Furlong Green was constructed by Messrs ‘Crest Nicholson Homes’ forming part of the Lightmoor development managed by Bourneville Trust. Comprises an entrance hallway which has a staircase ascending to the first floor, useful under stairs store cupboard, access to kitchen/diner and cloakroom/wc. The kitchen area has a range of base and wall units, integrated oven, five ring gas hob, fridge freezer, space for washing machine and tumble dryer. The dining area has glazed panel double opening french doors leading to the rear patio. 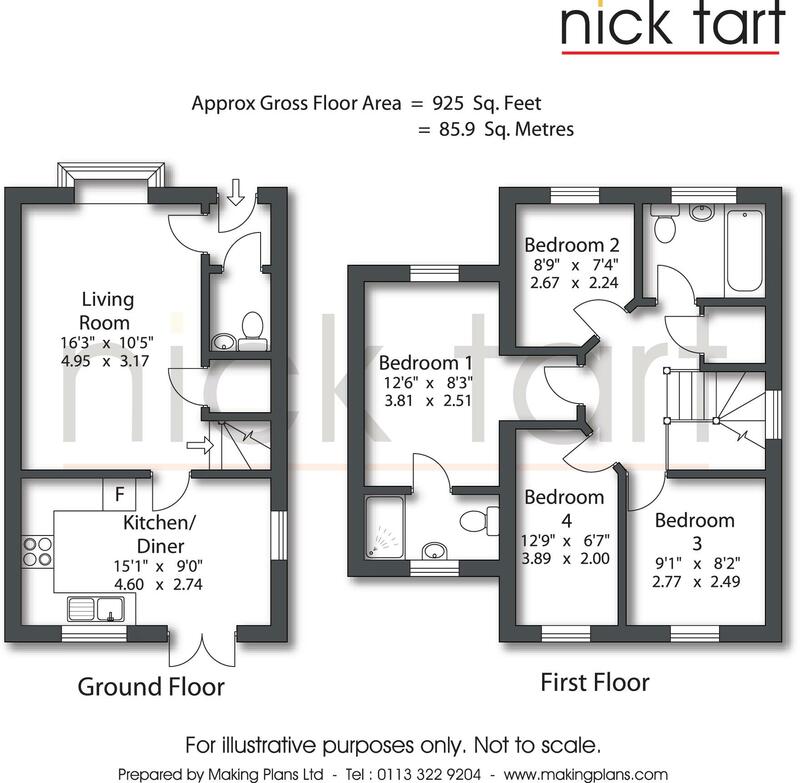 On the first floor there is a landing with loft hatch access point, access to four bedrooms and family bathroom/wc. Two of the bedrooms have splendid elevated rooftop views towards the rear. The master bedroom has the benefit of an en-suite shower room comprising double shower cubicle, wash hand basin and low flush wc. The family bathroom/wc has a white suite comprising panelled bath with shower over, wash hand basin and low level wc. The rear garden has a walled boundary, two paved patio areas, artificial grassed area with flower borders. A pedestrian door leads to the side of the garage which has an up and over door. An opening leads to an enclosed area where there are double doors leading to the side driveway. How to get there - from the Ironbridge office proceed along The Wharfage; at the mini roundabout turn right towards Coalbrookdale and continue up Jiggers Bank; at the roundabout take the second exit (signposted Horsehay) and turn right into Wellington Road – continue to the village centre (primary school on right) and at the T junction turn left – the property is on the right hand side.